Pensacola Tree Service offers brush removal service for when you have an unwanted tree and shrub debris. This could either be still growing and alive brush, or a brush pile you created through your own landscaping efforts. 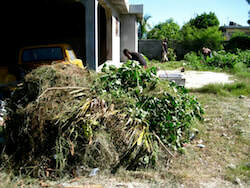 We have found many property owners unwittingly go about trimming trees and shrubs as well as removing brush only to discover the debris pile that created is beyond their ability to dispose of. Most property owners are ill-equipped to deal with large piles of brush and other tree debris due to lack of effective equipment, such as wood chippers and dump trucks. 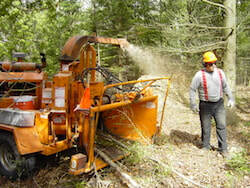 Further, even if they do have a pick-up truck, a tree trimming and other brush removal efforts can create a brush pile that quickly exceeds the carrying capacity of their vehicle. Therefore, we offer a brush removal service to aid property owners in eliminating tree and shrub debris quickly and inexpensively. Wood chipping is really just a subset of your brush removal service. If you have performed your own brush removal and have a pile to debris beyond your ability to dispose of efficiently, please call us for a free wood chipping estimate. We have first-class wood chippers from Vermeer that can quickly and efficiently dispose of even the largest piles of brush. Plus our four-man crews can quickly move your brush piles from wherever they are on your property to the curb where they can be chipped. As part of our wood chipping service, we take care of the dumping fees but often re-use the wood chips in an eco-friendly manner by composting it or re-purposing as mulch. Alternatively, we are happy to leave some or all of the wood chips on your property for similar purposes. Our team will so rake and clear the area(s) where the brush pile sat so the area is completed renewed. Even if you have done some brush removal on your own, we can usually offer you a discount as part of our wood chipping service to further trim some trees on your property that perhaps are beyond your ability to do. We advise our customers to seek professional tree care whenever the work requires you to leave terra firma. Climbing a ladder, or even worse, the actual tree is a very bad idea and could easily lead to injury. Always search for a professional "tree service company near me" if you ever need to perform tree work using a ladder. Our services are way cheaper and safer than the potential alternative of injuring yourself.